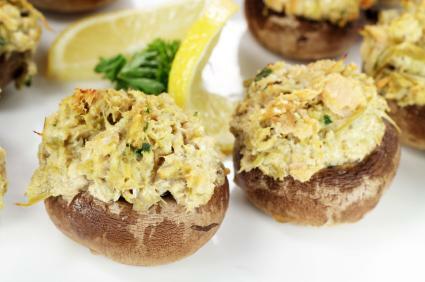 Combine crabmeat and mushrooms to make a wonderful appetizer or main dish. The earthiness of the mushrooms mixes with the sweetness of the crab to create a powerful flavor combination. While the recipes call for small crimini mushrooms for appetizers, you can also try using Portobello mushrooms for a main dish. Crab and artichoke dip is a popular appetizer. This recipe creates a twist, using the mushrooms as a handy container for the filling, eliminating the need for dipping. Place mushroom caps on a baking sheet, cup-side up. In a medium bowl, use a rubber spatula to cream together mayonnaise and cream cheese. Fold in artichoke hearts, parmesan cheese, scallions and crabmeat until just combined. Fill each mushroom with one to two tablespoons of filling. Bake for 15 to 20 minutes, until filling begins to brown. Use crimini or button mushrooms with this dish. Choose large mushrooms that will hold one or two tablespoons of filling. 1 pound of large mushrooms, cleaned. Slice fibrous end from mushroom stems. Remove remaining stem from mushrooms. Set aside the caps and chop the stems. Melt butter in a sauté pan. Add mushroom stems, scallions and pepper. Cook until softened. Set aside to cool. Combine crab, bread crumbs, salt, pepper and thyme. Add cooled vegetables. Place mushroom caps stem-side up on a baking sheet. Fill each with crab filling and sprinkle with parmesan cheese. Bake for 20 to 25 minutes, until cheese is melted and slightly browned. Consider the following when preparing mushrooms stuffed with crabmeat. Use a mushroom brush or dry paper towel to clean mushrooms. Do not rinse or wash them, because the mushrooms act as small sponges and soak up the water, resulting in waterlogged appetizers. If you choose to make these a main dish using Portobello mushrooms, remove the black gills in the mushroom. Increase baking time by about 15 minutes. Try replacing the parmesan with other hard Italian cheeses, such as asiago or Romano cheese, as well. Because of the mix of flavors in the appetizers, it is not necessary to use fresh crab meat. Buy good quality packaged crab meat (real crab, not imitation crab), which is available at the seafood counter of your local grocery store. Make sure the crab meat is well-drained, and that you have removed any shells from the meat. Use these mushrooms as a party appetizer, side dish or a main dish. For even more flavor, drizzle them with truffle oil before serving. The flavors lend themselves well to acidic white wines like Riesling, and also pair well with Champagne. Crab stuffed mushrooms are easy to make, but create an elegant presentation. The earthy, sweet flavors combine with savory Italian cheese to create a dish that's sure to become a favorite.